SCOTTSDALE, ARIZ. – Jan. 16, 2017 – Barrett-Jackson, The World’s Greatest Collector Car Auctions®, will help raise funds for charities supporting U.S. veterans, children and medical research during the 46th Annual Barrett-Jackson Scottsdale Auction, to be held Jan. 14-22, 2017, at WestWorld of Scottsdale in Arizona. Among the most anticipated vehicles crossing the block for charity is Rock and Roll Hall of Famer Steven Tyler’s 2012 Hennessey Venom GT Spyder (Lot #3003), with 100 percent of the hammer price benefiting Janie’s Fund. Celebrity personalities including Steven Tyler, lead singer of Aerosmith and former judge on American Idol, will be onstage Friday, Jan. 20, to help sell his 2012 Hennessey Venom GT Spyder (Lot #3003). 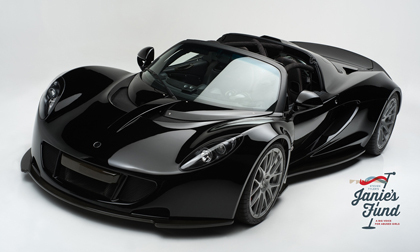 Offered from his personal collection, this Venom GT is five of 12 created and the first of the Spyder convertibles. This 7.0-liter V8 mid-engine, rear-wheel drive supercar produces 1,244 horsepower that sprints from 0-60 mph in 2.7 seconds and 0-200 mph in 14.5 seconds. One hundred percent of the hammer price will benefit Janie’s Fund, which is dedicated to providing resources to help abused girls. Dale Earnhardt Jr., world-champion pro stock car driver and team owner, is coming to the Barrett-Jackson stage on Saturday, Jan. 21, to help sell two vehicles that will each benefit Nationwide Children’s Hospital, a leading pediatric care facility and research institute. Donated by Chevrolet, a 1970 Chevrolet Chevelle (Lot #3006) that Earnhardt helped design is a contemporary Resto-Mod muscle car that uses a new GM Restoration Parts-licensed Dynacorn reproduction body and modern coilover suspension system. Lot #3006.1 is Earnhardt’s Hendrick Motorsports No. 88 Nationwide Chevrolet SS that he raced in six NASCAR Cup Series races between 2014 and 2015. 2016 GMC Sierra Custom Pickup (Lot #3000) – GMC commissioned this one-of-a-kind Sierra All Terrain from renowned artist Mickey Harris. All proceeds will benefit Stephen Siller Tunnel to Towers Foundation and Building for America’s Braveset. 1970 Chevrolet Camaro Z/28 (Lot #3001) – This very original and fully documented Camaro retains its original interior, door, panels, dash and headliner. All proceeds will benefit Childhelp. 2017 Chevrolet Camaro COPO #001 (Lot #3002) – This SEMA show car represents Serial #001 of 69 COPO Camaros that will be produced for the 2017 model year. All proceeds from its sale will benefit United Way. 2017 Ford Raptor Pickup (Lot #3004) – This 2017 Raptor takes years of Ford performance and engineering to the next level. It is the last VIN produced for 2017 and finished in a unique one-of-one color. All proceeds from its sale will benefit Juvenile Diabetes Research Foundation. 1930 Cord L29 4-Door Brougham (Lot #3005) – One of only 5,010 produced, this L29 Cord was a very high-tech vehicle for its day and was the first American front-wheel drive production car. All proceeds from its sale will benefit Loma Linda University Children’s Hospital. 2015 Ford Mustang GT Fastback (Lot #3007) – This “Jack Roush Tribute” Mustang brings together classic nostalgia of the past with all the styling and performance of the present. All proceeds from its sale will benefit Military Assistance Mission, Inc.